I have been itching to play with vmm. I tried to get it working on an old Acer laptop and an IBM System X server, without any luck. I asked what was up, and heard from jbg@ that vmm requires a CPU with Nehalem microarchitecture or newer, and that the Intel P6200 in this machine lacks some of the instructions needed for vmm. Well, that would have been nice to put in the documentation. Perhaps I'll submit a diff. I decided it'd be fun to try to upgrade the CPU in the Acer so I can finally play around with vmm in -CURRENT. 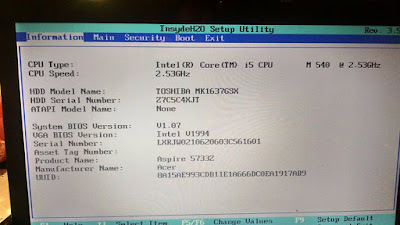 Believe it or not, I've never attempted a laptop CPU upgrade. I've only replaced CPUs with the same spec before, replaced thermal interface compound, and upgraded RAM and hard drives. I went on the hunt for PGA988 (Socket G1) Arrandale-based processors with 35w TDP (so the existing heat sink and fan, designed with the P6200 in mind, can keep up). Sure enough, some of the first-generation i5 and i7 mobile processors fit the bill nicely. On a really tight budget, I scored an i5 540M for $12 shipped. At the high-end, I could have splurged on an i7 640M to really wring everything out of it -- as far as I can tell. The only difference between the CPU I bought and the best i7 I could shoehorn into this laptop are an additional 1MB of SmartCache and 250MHz. Since my goal was simply to get vmm working, $12 was a bargain. Many laptops make it a breeze to change hard drives. Some even have easy access to swap RAM, WiFi adapters, and optical drives. This Acer is easily serviceable for these parts. The CPU is a bit more difficult to get to. It's on the bottom of the motherboard, and it requires one to remove the keyboard, the top of the base, remove a handful of ribbon cables and connectors, and completely remove the motherboard, heat sink and cooling fan as a single assembly. 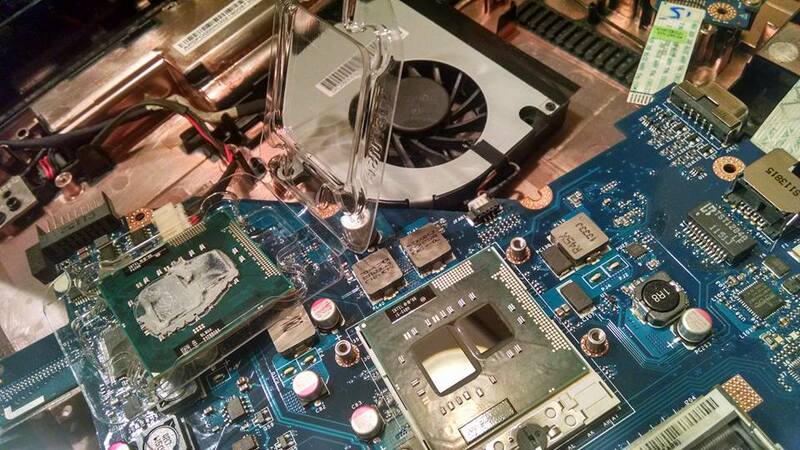 Once the board is exposed, it's pretty simple to remove the heat sink, open the socket and swap processors. The most crucial part of upgrading the CPU is making sure you have a good thermal interface between the processor dies (shiny metallic parts) and the body of the heat sink. I used a thermal paste that I've had good luck with in the past. For a 35w CPU, you don't need to splurge, but you should follow the instructions closely if you are unfamiliar with the process. I slapped most of the parts back together without re-assembling the entire laptop case to see if it would even boot. Remember, this was uncharted territory for me. Looks like success! Of course, there's still a matter of whether the BIOS will pass the virtualization options to OpenBSD. 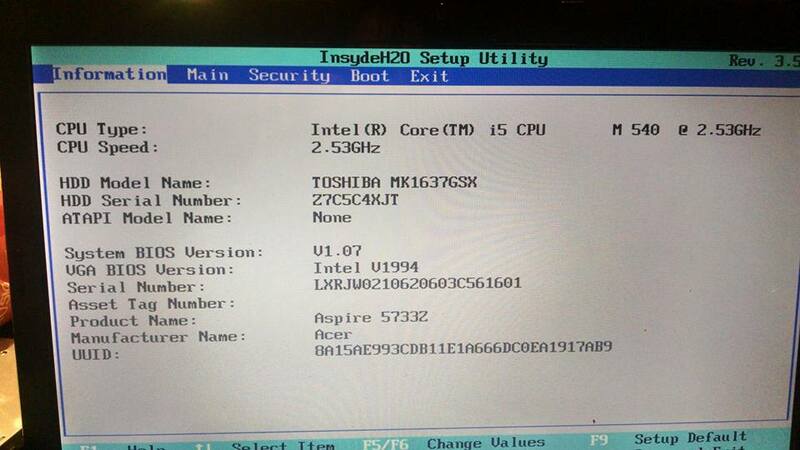 This is basically the worst BIOS setup I've ever seen, and it doesn't give me any options for virtualization. I had already compiled a fresh OpenBSD kernel with vmm(4) enabled, so I went ahead and put the laptop back together, and booted the vmm capable kernel,started vmd and fired up the virtual machine. No errors! I attached to the virtual serial console, and a few seconds later, saw the kernel booting. This coming weekend, I'll probably try to figure out how to get networking configured. This definitely isn't Parallels Desktop, but it's not any more daunting to set up than QEMU was.